A girl places a note into a crack of the Western Wall in Jerusalem. Placing notes in the Western Wall refers to the practice of placing slips of paper containing written prayers to God into the cracks of the Western Wall, a Jewish holy site in the Old City of Jerusalem. It is claimed that occurrence of such a phenomenon dates from the early 18th century and stems from the Jewish tradition that the Divine Presence rests upon the Western Wall. There is however a dispute as to whether it is permissible according to Jewish law to insert slips of paper in to the crevices. Some argue that the practice debases the holiness of the Wall and that the placement of notes should be discontinued. Over a million notes are placed each year in what has become a custom, not only for tourists, but also for high-profile dignitaries visiting Israel from abroad. The notes are collected twice a year and buried on the nearby Mount of Olives. Notes wedged into the cracks of the Western Wall. The earliest account of the placing prayer notes into the cracks and crevices of the Western Wall was recounted by Rabbi Chaim Elazar Spira of Munkatch (d. 1937) and involved Rabbi Chaim ibn Attar (d. 1743) who instructed a destitute man to place an amulet between the stones of the Wall. 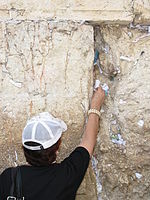 The rationale behind placing prayer notes in the Wall has been traced to the Midrashic teaching that the Divine Presence has never moved from the Western Wall,[dubious – discuss] and the Kabbalistic teaching that all prayers ascend to Heaven through the Temple Mount, which the Western Wall abuts. A woman places a prayer note in the Wall. Rabbi Shmuel Rabinovitch, Rabbi of the Western Wall, receives hundreds of letters yearly addressed to "God, Jerusalem"; he folds these letters and places them, too, in the Wall. According to Jewish law, prayer notes may not be thrown away; there is a difference of opinion as to whether they should be burned or buried. According to Rabbi Shmuel Rabinovitch, Rabbi of the Western Wall and author of Minhagei HaKotel, a book of halakhot about the Western Wall, burning is a "pure" way to deal with the notes, but burying them is more honorable. Rabinovitch further states that the letters are buried because they have the status of letters to God. Twice a year, Rabinovitch and his assistants collect the notes left in the Wall and bury them in the Jewish cemetery on the Mount of Olives. The tradition of leaving notes for God in the Western Wall has also been adopted by Christian pilgrims and people of other faiths. Foreign dignitaries who have publicly placed a message in the Western Wall include Pope John Paul II (in 2000), Pope Benedict XVI (in 2008) and Pope Benedict XVI, again in 2009, who released its contents to the media. U.S. Senator Hillary Clinton deposited a note in 2005. In July 2008, U.S. presidential candidate Barack Obama placed a written prayer in the Wall. After Obama and his entourage departed, his note—written on hotel stationery—was removed from the Wall by a seminary student who sold it to the Maariv newspaper. The newspaper published the note, prompting criticism from other news sources and from the Rabbi of the Western Wall for violating the privacy that is inherent in notes placed in the Wall. In July 2012, U.S. presidential candidate Mitt Romney placed a written prayer in the Wall. His note was later moved to a different location in the Wall for privacy reasons and to avoid a repeat of the incident with Obama's note in 2008. On May 22, 2017, Donald Trump became the first sitting U.S. President to visit the Wall; he also inserted a note. Trump's Vice President, Mike Pence, visited the Wall and deposited a prayer note on January 23, 2018, at the conclusion of his four-day visit to Israel. ^ a b Journal of Halacha and Contemporary Society. 43-44. Yeshiva Rabbi Jacob Joseph School. 2001. p. 94. A practical issue in connection with the kotel ha'maravi is whether it is permitted to insert one's fingers or notes into the crevices of the wall" and "Others have argued that since this pollutes the kotel, and there is no halachic reasoning for this practice, that it is not proper to allow it to continue. ^ Simmons, Rabbi Shraga. "What is the Origin, Process and Reason Behind Placing Notes in the Western Wall?". about.com. Retrieved 2010-01-13. ^ Pirke De-Rabbi Eliezer 35: "Anyone who prays in this place in Jerusalem, it is as if he prayed before the Throne of Glory, for the gate of heaven is there, open to hear all prayers". ^ Simmons, Rabbi Shraga (3 November 2002). "Six Reasons Why The Wall Is Holy". Retrieved 6 October 2010. ^ McGirk, Tim (25 July 2008). "Obama's Private Prayer 'Leaked'". Time. Retrieved 2 October 2010. ^ a b c d "Where Do All the Prayer Notes Go?". ABC-Australia news report. 5 September 2007. Retrieved 2010-01-18. ^ "Not in Yerushalayim? Send a Kvittel to the Kosel via Twitter". matzav.com. 22 July 2009. Retrieved 2010-01-18. ^ Starr, Joyce Shira (1995). Faxes and Email to God: At the Western Wall of Jerusalem. iUniverse. ISBN 978-1-893652-37-8. ^ Eilen, Shia. "Interview with Harav Shmuel Rabinowitz, Rav of the Kosel". Hamodia Features, September 28, 2017, p. 10. ^ "Letter Placed by Pope John Paul II at the Western Wall". Ministry of Foreign Affairs (Israel). Retrieved 2008-10-07. ^ "Pontiff Visits Judaism's Holiest Site, the Western Wall". necn.com. 12 May 2009. Retrieved 2010-01-18. ^ "Pope Places Note of Peace in Jerusalem's Western Wall". Canadian Broadcasting Corporation. 2009-05-12. Retrieved 2009-05-31. ^ Associated Press (15 November 2005). "Hillary Clinton visits Western Wall". Haaretz. Retrieved 5 April 2011. ^ McGirk, Tim (2008-07-25). "Obama's Private Prayer Leaked". Time. ^ "Rabbi Condemns Release of Purported Obama Prayer Note". CNN. 27 July 2008. Retrieved 2010-01-18. ^ Haake, Garrett (29 July 2012). "Mitt Romney visits Western Wall, one of holiest sites in Judaism". NBC News. Retrieved 23 October 2014. ^ Tepper, Greg (30 July 2012). "Romney's Western Wall Note Removed". The Times of Israel. Retrieved 23 October 2014. ^ Diamond, Jeremy (22 May 2017). "Trump makes historic visit to Western Wall". CNN. Retrieved 22 May 2017. ^ Eglash, Ruth; Johnson, Jenna (23 January 2018). "Prospects of peace elusive as Pence wraps up visit to Israel". The Washington Post. Retrieved 23 January 2018. "Ask the Rabbi: Writing on the Wall"
Send an Online Prayer Note to be placed in the Kotel by volunteers. Wikimedia Commons has media related to Notes in the Western Wall.